Iconic former Leicester City captains, Steve Walsh and Matt Elliott, joined forces with Filbert Fox on Thursday to provide the first-ever Premier League Primary Stars session in New York City. Primary Stars, an ambitious Premier League initiative which uses the appeal of football to inspire primary school children, is a UK-based curriculum-linked programme which provides free lesson plans, online resources – and the chance to experience once-in-a-lifetime opportunities. Never before has the scheme, provided by 88 Premier League and Football League clubs, ventured stateside. So, Walsh, Elliott and Filbert Fox – alongside staff from the Club’s Supporter Engagement team and the LCFC Community Trust – dropped by at The Dag Hammarskjold School in Brooklyn to deliver a school day like no other. Before a speech centred on positive sporting attitudes during assembly, Walsh and Elliott, with over 600 appearances for the Foxes between them, provided light-hearted soccer coaching sessions. Foxes legends Matt Elliott and Steve Walsh, joined by Filbert Fox, take the Premier League Primary Stars to New York. 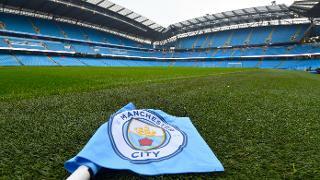 While the main event does not take place until Saturday – Premier League Mornings Live, a fan-based extravaganza staged in the heart of the city that never sleeps – the Club will have a presence at the heart of New York City life over a five-day period. Alongside Filbert, Walsh and Elliott - two of the most iconic players to wear the Leicester City shirt - will head to the homes of baseball giants New York Mets and basketball side New York Knicks this weekend. They'll also join stateside Leicester City supporters' group, New York Foxes, to watch Claude Puel's men tackle Tottenham Hotspur on Saturday evening (7:45pm GMT kick-off) before staging soccer tournaments and special Q&A sessions on Sunday. You can tell just from speaking to the children that a lot of them know who Leicester City are and it’s been a great experience for everybody today and I hope they take a lot from it. Speaking after a fun-filled day in Brooklyn, promoting the importance of healthy lifestyles and sports participation, Walsh told LCFC TV: “It’s absolutely fantastic to be here in the United States. “My first school coaching session has certainly gone down well and it’s great to be part of Leicester City and initiatives like this at schools in the United States. “It just shows you the recognition of the Football Club and everybody is starting to know who we are which is fantastic to see in a city like this. Meanwhile, Kerri Moser, the Assistant Principle at The Dag Hammarskjold School, was equally as thrilled to see her students embracing everything on offer during the day. Walsh, Filbert and Elliott pose for a photo with an iconic New York school bus. 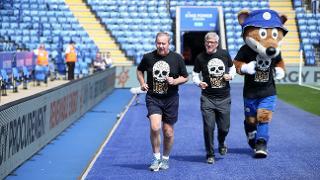 Elliott and Walsh spoke on stage about the importance of teamwork, while coaches from the LCFC Community Trust emphasised the importance of compassion and kindness in daily life. “It’s just been fabulous,” she told LCFC TV. “It was such an amazing experience and the children were just so involved with both the sport and the compassion project that we’ve been afforded by the Premier League. “It was fabulous. The excitement and energy-level that was carrying on from 8:30am this morning until now, two hours-plus later, it’s just wonderful. At the end of the day, the Club presented the school with free replica shirts – to accompany special USA-themed Leicester City flags and signing cards. Filbert Fox showed off his best dance moves during assembly. It's hoped that the students will take away with them a renewed passion for the sport which they can carry forward in their lives and Moser was delighted to see their enthusiasm firsthand. 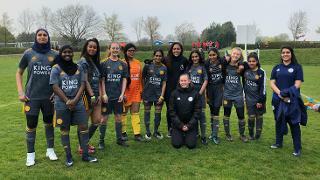 She continued: “We’re honoured, privileged [to have hosted Leicester City and the Premier League Primary Stars], it’s amazing to have that here. “We’ve been experiencing some firsts at our school recent because had an event with NASA and the International Space Centre. “This reminds me of that experience, which we just had in June, and it’s out of this world. Make sure to stay tuned to LCFC.com over the coming days for more from New York as Filbert and the duo of former captains continue take Leicester City stateside.